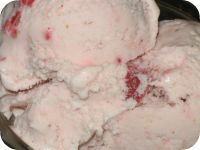 Before we get started creating homemade ice cream recipes, think about what kinds of ice cream your family loves to eat. and just start with what you like. Give them the old "You'll eat whatever I fix or go without" rule. no one will care what flavor you make. They just want ice cream! 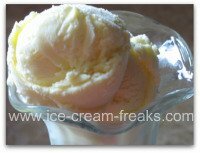 The easiest way to come up with your own homemade ice cream recipes is to start with a basic homemade vanilla or chocolate ice cream recipe and then modify it to create other ice cream recipes. ( It's called experimenting. 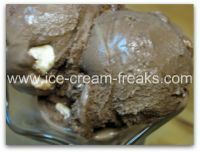 Ok, although I'm no expert in making ice cream, I will tell you how I came up with my recipes. The first thing I did was study other homemade ice cream recipes (including the ones that came with my ice cream maker). I noticed patterns and got a feel for the basic ingredients in recipes that were very easy to make and didn't require cooking with heat. You know, something my kids could mix together. The heavy cream and whipping cream was too creamy and the half and half was not creamy enough. And yes, I did try using different ratios of heavy cream to half and half or milk and whipping cream to half and half. You'll probably have to do a little trial and error also to find what you like. After I decided on a basic recipe, I started adding other flavors and ingredients like extracts or crushed cookies, chocolate chips, cookie dough (without eggs), fresh fruit, etc. 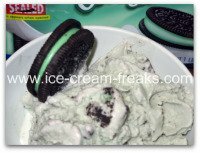 (One time I made mint chocolate chip using mint extract, which has spearmint and peppermint flavors. It tasted like mint flavored gum. Kind of strange, but the kids liked it. Still, I doubt I'll make that again). To create my cookies and cream ice cream , I just added some crushed oreo cookies to my basic vanilla ice cream during the last 5 minutes. This turned out great, so I've included it on this site. Don't worry about making mistakes. It's all part of the fun of creating your own flavors of ice cream. Get the whole family involved. Try out their ideas. Maybe even give your flavors goofy names (like Ben and Jerry's does). Just remember to have fun. 'Cause isn't that what ice cream is all about? Do You Have One of the BEST Homemade Ice Cream Recipes? So you think you have one of the best ice cream recipes? We would love to try it. Please share it along with a picture of it!